Excellent touch-up so repairs are less visible. 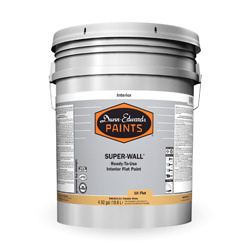 SUPER-WALL® Ready-To-Use is a professional interior washable latex flat paint that provides excellent touch-up and good hide. SUPER-WALL® Ready-To-Use is designed for use on interior walls, ceilings, and other properly prepared and primed new surfaces. 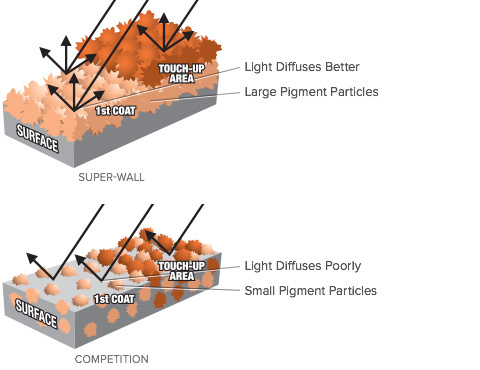 SUPER-WALL® has large pigment particles, which resist being absorbed into the surface. This creates a smooth, uniform finish that is better at diffusing light. When touched-up, the new coat of paint blends with the original coat better, so it becomes less visible. 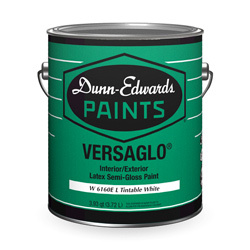 The competition’s smaller pigment particles allow more paint to be absorbed into the surface. This creates a thinner finish that does not diffuse light as well. When an area is touched-up, the paint sinks into the surface resulting in noticeable touch-up. These are digital photographs of actual test results. To view the actual test results, please contact the Dunn-Edwards Corporation. 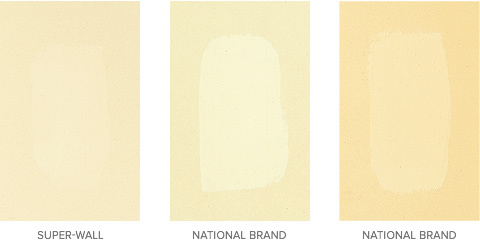 It is always recommended that SUPER-WALL® be used over properly prepared and primed surfaces.